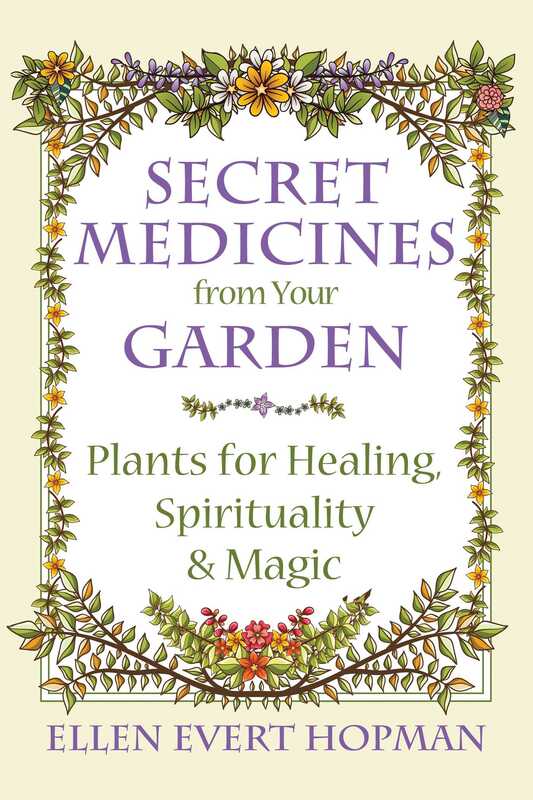 Weaving together ancient wisdom, mystical folklore, and modern plant research, master herbalist Ellen Evert Hopman explores the many uses of flowers, trees, common weeds, and ornamental plants for food, medicine, spiritual growth, and magical rituals. She reveals the herbal lore surrounding each plant, drawing on traditional knowledge and remedies from around the world, including Native American, Celtic, and Egyptian traditions. She includes recipes throughout so you can make medicines from wild and domesticated plants easily found in yards, forests, meadows, and hedgerows, and she discusses what to plant to ensure you have leaves, berries, and flowers all year. The author reveals how to quickly intuit an unknown plant’s properties using the signatures of plants--universal indications and contraindications based on the form, color, and location of a plant. She includes an in-depth section on honey and Bee Medicine, allowing you to appreciate the labors of these plant-dependent insects. Exploring the magical role of herbs in ancient ritual, Hopman provides recipes for Egyptian temple incense and their sacred medicine known as “Kyphi” or “Kaphet,” used to purify the body, banish insomnia, and promote vivid dreaming. She explores shamanic Plant Spirit and Animal Spirit Medicine as well as herbal astrology. She also explains the “triangle” formula-making system of her herbal mentor William LeSassier to help you develop custom herbal remedies tailored to a person’s unique strengths and weaknesses. Showing how to easily incorporate wild plants into your life to receive their healing benefits throughout the seasons, Hopman reveals the power of the bounty that Mother Nature has provided right at our doorstep. I live in an oak forest in New England. There is very little light here for growing things, so I mostly rely on wildcrafted roots, barks, leaves, flowers, and berries, but I follow a few cautions before I pick. Every season brings its own moment of opportunity; in the spring there are already an abundance of edibles and medicinals available in fields and forests, for those with the eyes to see and the determination to seek them out. The delicate white flowers of Bloodroot are among the first flowers to appear in woodlands in spring. The roots were once added to tinctures and syrups for lung conditions such as asthma, bronchitis, and fevers. As they are now considered a toxic irritant, a better way to deliver the medicine is to put the tincture or tea of Bloodroot into a vaporizer and inhale the mist. It helps to open the capillaries in cases of COPD (chronic obstructive pulmonary disease) and other lung disorders. Bloodroot, an antiseptic, is used in toothpastes and mouthwashes. Chichorium intybus is a familiar bright blue wayside flower. Gather the young leaves before the blossoms appear and add them raw to salads or cook them like spinach. The leaves are also used in poultices for inflammations. Later in the season you can sprinkle the open flowers onto salads, open-faced cream cheese sandwiches, and cakes. Try freezing them into ice cubes for festive occasions. The roots can be gathered from March to May. Sauté the root when fresh or dry it, grind it, and add it to coffee. A tea made from the roots will aid the digestive tract. A tea can also be made of the leaves and flowers (don’t pick after blooming); it will clear mucus, aid in passing gallstones, and improve digestion. Acne, liver problems, eczema, rheumatic complaints, and gout may also benefit from the tea. Tea made from the leaves can also be used as a mouthwash for gum conditions. To make the tea: simmer one teaspoon chopped root per half cup water for ten minutes or steep one teaspoon herb per half cup water for twenty minutes. Take one tablespoon three times a day in separate doses, in water or milk. Dandelion greens are at their best in the early spring when they first appear. Soak them in cold water with a few tablespoons of sea salt or vinegar added to remove parasites, for about twenty minutes. Then rinse the leaves and eat them mixed into a salad, or cook them like spinach with a little butter, sea salt, and lemon juice. You can also dust them with flour, salt, and pepper and then fry in butter. A classic way to cook Dandelion greens is to sauté them with onion and bacon. The flowers are used to make Dandelion wine. Add the petals (but not the green sepals, which are too bitter) to salads for a calcium boost. Dandelion root tea is used for acne and eczema and for liver issues. To make the tea: After soaking the roots in water with vinegar or salt added beforehand to remove parasites, then simmer two teaspoons of root per half cup water for about fifteen minutes. Take up to one cup a day in quarter cup doses. Yellow Forsythia flowers are some of the first spring blooms. Add a few to your salad. Nettles are antihistaminic and a nice alternative to allergy medications. Fresh Nettles should be gathered while wearing rubber gloves. Rinse for a few seconds under cold water in the sink and all traces of the “sting” will disappear. Caution: do not eat Nettles raw. Nettles can be added to soups, sautéed with other vegetables, folded into omelets, and so on. Try baking Nettles into a pie or adding them to quiche. Delicious! Nettles can be made into a warming tea. To make the tea: steep three tablespoons chopped Nettles for three to ten minutes in a cup of freshly boiled water. Add the flowers of Norway Maple (Acer platanoides) to salads. Ellen Evert Hopman has been a teacher of herbalism since 1983 and is a professional member of the American Herbalists Guild. A member of the Grey Council of Mages and Sages and a former professor at the Grey School of Wizardry, she has presented at schools and workshops across the United States and Europe. A Druidic initiate since 1984, she is a founding member of The Order of the White Oak (Ord Na Darach Gile), a Bard of the Gorsedd of Caer Abiri, and a Druidess of the Druid Clan of Dana. A former vice president of The Henge of Keltria, she is the author of A Druid's Herbal of Sacred Tree Medicine; A Druid’s Herbal for the Sacred Earth Year; Walking the World in Wonder; Being a Pagan; Tree Medicine, Tree Magic; and Priestess of the Forest. She lives in Massachusetts. "Mind-blowing! Hopman has found a way to pack a veritable treasure trove of herbal lore into a clear, precise and engaging volume. The contents are organized beautifully, starting with a primer on wildcrafting and the “doctrine of signatures” while following with a season-by-season guide to harvesting and utilizing nature’s potent healing energies. A wonderful addition to the library of any naturalist, herbalist, witch or alchemist."